Enjoy the prime location of this 2 bedroom condo on Park Ave. Downtown Breckenridge restaurants and shops are within walking distance of our front door. Park in our underground parking and leave your car there for your entire stay. An energetic walk will take you to the QuickSilver Super6 Lift or 50 steps to catch the free bus to Peak 8 or 9. Ski-in from the 4 O'Clock Run ending with a short walk to the condo or proceed onto the Apres Ski bars and enjoy the nightlife. The 1,138 sq. ft. first floor condo is remodeled with new carpet, granite countertop, new appliances, and electronics. Ski or hike all day and come back and relax in the hot tub right next door. Downtown Breckenridge is at your doorstep. High speed internet access is available. Relax in front of the wood burning fireplace after a day of skiing, hiking, biking, and shopping. Large living room, dining room, and breakfast bar. Master features a queen bed, private bath, and TV. Second bedroom has single bed and a set of bunk beds, TV, and DVD player for the kids to watch movies or play games. A queen sofa sleeper, and love seat sleeper allow for additional sleeping. There is a fully equipped kitchen for your convenience. On site indoor hot tub and sauna. A covered community heated pool is within a l 1/2 block brisk outdoor walk. Showers, lockers, and changing area are provided. Cook up some steaks on the grill on the community patio or make dinner in the fully equipped kitchen. Enjoy a glass of wine to soft music from the stereo or party hearty, your choice. TV's are in all the rooms. Breckenridge and Summit County provide year round activities. Use Breckenridge as your base to ski or shuttle over to Keystone, Copper Mountain, or Vail. Cross country ski from the Nordic Center just up the hill. The Breck Recreation Center provides tennis, swimming, indoor rock climbing, weights, running, and exercise equipment all at an extremely low price for the individual or family. Summer months you can fish The Blue or hike to the sky-whatever your pleasure may be. Bike or hike the many trails in the area-from Breck to Vail via maintained paths. Public golf courses are available in Breck, Keystone (2), Copper Mtn., and Vail. Summer outdoor concerts with local and visiting artists. Shopping is available at the resort or the outlet mall in Silverthorne. Gambling is only an hour away. My wife and I live in Denver metro, which is about 1 hour 15 minutes from our Breckenridge condo. Our two boys have recently graduated from college. As a family, we loved all of the skiing, hiking, biking, and other outdoor activities around Breckenridge. We love the Breckenridge area. When we were looking for a condo purchase, we were drawn to the Cimarron condo because of the centralized location, the large great room, and the wood burning fireplace. We have really loved the place and use it frequently. The centralized location allows walking to the ski slope, shopping, restaurants, and night life. The free Summit shuttle picks up right across the street. (3) There are 3 coin operated washers in the laundry room which is located at the basement level just off of the elevator. (4) There are 4 coin operated dryers in the laundry room which is located at the basement level just off of the elevator. Internet access is available - Password is given at the time of full payment. Living room has comfortable seating for 7, television, fireplace, and a variety of games. (3) Television in living room and in both bedrooms. DVD player in second bedroom and a bluray/DVD player in the living room. Board games, cards, dominoes, and jigsaw puzzles provided. Each condo has a small balcony. Our condo is one block from the ski lift and one block from two different ski runs. There is also a sled provided in the condo. Sauna and hot tubs are available on the first floor next to our condo. Pool is easily accessed with a short walk along an outside path. Changing rooms, shower and hot tubs are available there. There is one shared hot tub in the condo complex. Start of our spring break before we head to SW Florida and warm weather. Condo was absolutely perfect for our family of 5. Great location and easily walkable to town and lifts. Very spacious and cozy and had everything we needed. Wood fireplace was great and hot tubs were perfect at the end of a long day skiing. Highly recommend to families. Our stay in this condo was very enjoyable. The living/dining area was surprisingly spacious. We could easily walk into town or catch a bus right across the street. And it was a short drive to drop the skiers off at the Quicksilver lift. Parking in the garage was an added bonus. The highlight of our week was watching the moose eating the branches off the aspen trees outside our deck! The momma and baby moose visited us twice and our grandkids were so excited. It was a great week for our whole family. 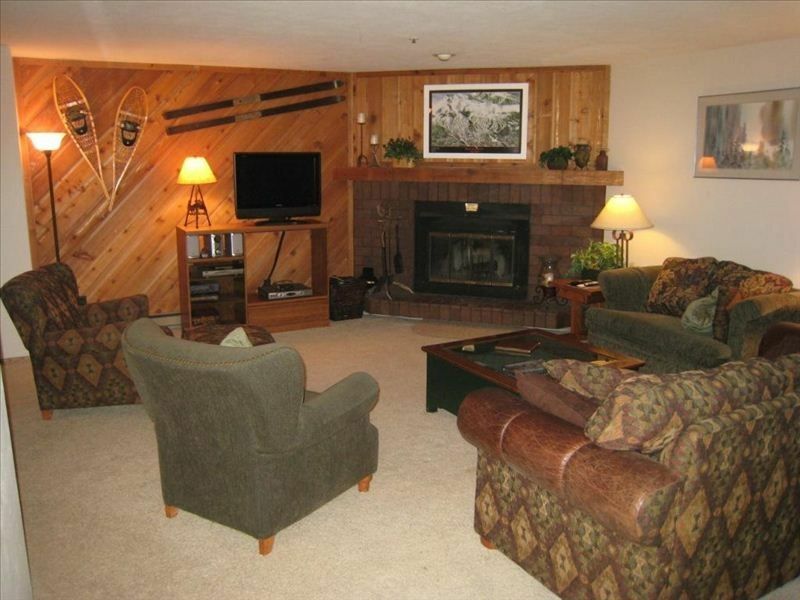 Our family enjoyed the condo, very spacious and convenient to town and base of peak 9 for ski lessons & lifts. Very Spacious condo in the heart of Breckenridge. Ski during the day and hit the hot tubs and/or pool after skiing. Walk to restaurants to dine in the evening. My family loved the experience and I would definitely recommend if you want to be close to both the ski lifts and the Main St. of Breckenridge. This was a great condo for our family! So close to the ski lifts that even my 5 year old could carry her skis there. And being only a block from Main Street and the Village allowed us to get the most of our Breckenridge vacation. Would definitely recommend this property to anyone looking to be in the middle of everything. Cimarron condo complex has a non-smoking and no pet policy.